Patent attorney Nate Scarpelli (BSEE '58) was new to the Chicago law firm of Merriam Marshall Shapiro Klose when the firm assigned him the task of patenting PLATO, the plasma display, and other ideas for the U of I. The "Merriam" was Charles Merriam, who sat on the board of the U of I Foundation and was the driving force behind University Patents, originally set up within the Foundation to license U of I patents, but later spun-off into the publicly held University Patents, Inc. The push was on to commercialize U of I technologies—a new and controversial course for the century-old land grant institution—with an eye toward building the university's endowment. 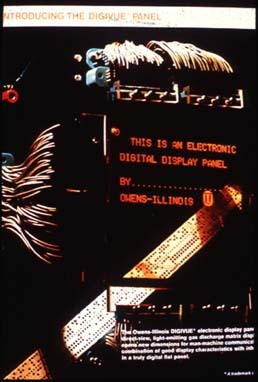 Although the first patent covering the fundamental operation and applications of the plasma display panel was not granted until 1971 ("one of the most complete applications I think I've ever done," recalls Scarpelli), U of I began collecting on the technology as early as 1967. That year U of I sold an exclusive license to the Owens-Illinois glass company, which would deliver the first commercial-grade "Digivue" displays for use in PLATO in 1971. IBM took an early interest as well, and the lure of Big Blue's prestige and deep pockets forced Merriam and Alpert into some ticklish negotiations between the two corporate players, with the happy result that U of I collected a million dollars from IBM in exchange for another license. That license would lead in 1983 to the IBM 3290 Information Panel, "the industry's first mass-produced, large-screen plasma display terminal for commercial use," according to an IBM advertisement. TV companies including RCA, Zenith, and General Electric took notice of early press reports about plasma displays as potential "hang-on-the-wall" TVs. Some took out licenses, but they all sent visitors to see what was happening at CERL. Zenith provided the phosphors for Edward Stredde's (BSEE '66, MSEE '68) master's work on a multicolor plasma display. 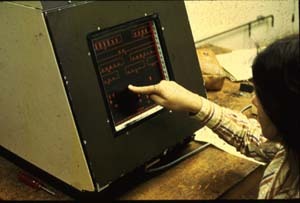 After finishing his PhD in 1975 with a dissertation on the discharge dynamics of plasma displays, Weber joined the CERL staff and began consulting to U.S. companies interested in such commercial applications of the Illinois technology. Another CERL alum, Roger Johnson (BSEE '65, MSEE '66, PhD '70) joined the ECE faculty in 1971 and found his consulting home in the Pentagon and its contractors, which included Magnavox, Science Applications International (now SAIC), and the Owens-Illinois spin-off Photonics Systems. Johnson would leave his faculty post in 1977 and spend the next 25 years at SAIC developing flat displays and mobile workstations. In 1982, the company manufactured its "Plasmascope" displays for controlling ground-launched cruise missiles. The displays were "nuclear hardened" to withstand the radioactive environment of a nuclear war. Similar displays went into the Trident nuclear attack submarine and the "Doomsday Plane"—officially known as the Advanced Airborne Command Post, a Boeing 747 outfitted to control U.S. forces in a nuclear war. Photonics and Magnavox collaborated on the largest plasma displays of the time, status boards used by the Air Force to monitor air operations. Japanese companies were among the first to take out licenses and begin their own plasma display research, enjoying the support and encouragement of NHK, the government broadcasting system that had advocated HDTV as early as the 1960s. Among the prominent Japanese engineers who visited CERL to study plasma displays was Heiji Uchiike, now of Saga University. Uchiike spent a year at CERL in the early days of the plasma display and has gone on to train many of the top plasma engineers in Japan. Japanese companies who sent visitors to CERL, many of them staying for extended periods, include Fujitsu, Hitachi, Matsushita, Sony, NEC, and even NHK. These companies, especially Fujitsu, have made important developments based on the fundamental ideas that came out of Illinois. Bitzer noted that the Japanese also saw plasma as an answer to the problem of displaying their Kanji script, something the Western alphanumeric computer displays of the early 1960s could not do. So plasma panels became widely used in Japan for cash registers, meters, and public signs. The transparency of the monochrome plasma displays allowed slides to be superimposed on images read from the computer.